The group is based out of Saint Pauls North Carolina. A small town located just south of Fayetteville on I 95. The band began in 1995 with Bobby and Will followed by Jay a short time later. Originally a four piece band with Jay on lead vocals, the band went to power trio status after their bass player left. 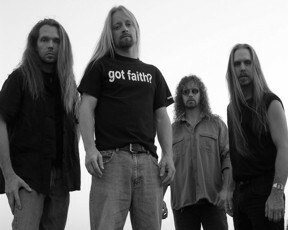 Jay stepped up to play bass and sing lead as they recorded their first project and independently released CD "The Time of My Return", recorded in 1997. After three years of live performances and upon God's instructions, they began preparations to transform their small rehearsal room into a recording studio. They began recording "Once and for All" in June of 2002. After several songs were tracked, the trio realized that their vocal skills did not stack up to their instrumental skills. God dropped Steve's name in the mix. Having had known each other for some time, they decided to give it a try. “Once and for All" was completed in May of 2003. Jesus Joshua 24:15's relationship grew with David Kelsey founder of Soul Joy Records and he offered them a spot on the Labels roster to release their new CD. With a new heavier sound the band was eager to burn up the roads and burn them up they did. Again with the guidance of God the band hit the studio in the spring of 2006 to record their third project "3 The Hard Way" to be released on Soul Joy Records in the fall of 2006. Jesus Joshua 24:15 has also link up this year with Charis Core management to handle all their booking arrangements for a new tour in 2007.With this latest release Jesus Joshua 24:15 continues to take the Gospel of Christ to the lost without compromise, giving the world what it needs and the Body of Christ what they want to hear. Jesus Joshua 24:15 has worked with “The 7 Method”, “Building 4:29”, "Disciple” and many others. Jesus Joshua 24:15 has a dynamic light and stage show that lifts up the name of Jesus and brings in the Power of the Spirit for a night of communion with God.